We’d love your help. 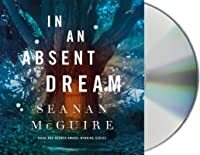 Let us know what’s wrong with this preview of In an Absent Dream by Seanan McGuire. When she finds a doorway to a world founded on logic and reason, riddles and lies, she thinks she's found her paradise. Alas, everything costs at th This fourth entry and prequel tells the story of Lundy, a very serious young girl who would rather study and dream than become a respectable housewife and live up to the expectations of the world around her. As well she should. To ask other readers questions about In an Absent Dream, please sign up. Can I start with this one or the stories are related? When I read Every Heart a Doorway, Down Among the Sticks and Bones, and Beneath the Sugar Sky, I thought I knew what it was to fall completely, utterly, in love with fairy tales. I knew nothing. This is my favourite book yet in this gorgeous series. If I could rate it higher, I would. It's a beautiful, evocative fairy tale. This is my favourite book yet in this gorgeous series. If I could rate it higher, I would. It's a beautiful, evocative fairy tale. It's about outsiders, not fitting in, and - most of all - about how it is to live in a world that is so terribly unfair. Through McGuire's magical and eerie past tense, we follow Katherine Lundy through a door and into another world. 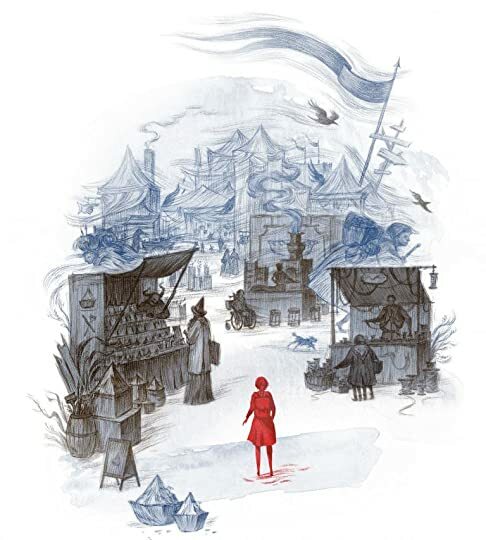 The world here is based on Rosetti's Goblin Market, and the author captures all the magic and the mayhem of the poem, as well as bringing her own spin to the tale. I was afraid I may not like it as much as the other books because Laini Taylor also wrote a spectacular Goblin Market-inspired short story - Goblin Fruit - but they are very different and both can be enjoyed without competing with each other. In this version of the Market, everything must receive its fair value. The world of the Market enforces this rule and there's no way of escaping it. Fair value differs from individual to individual. A coin to someone with a thousand coins is worth less than a coin to someone with five coins. McGuire deftly offers a critique of a world where everyone is selfish and tries to capitalize on others, especially those who cannot afford what others can. It hits close to home. It is so often easy, when one has the luxury of being sure a thing will never happen, to be equally sure of one’s answers. Reality, it must sadly be said, has a way of complicating things, even things we might believe could never be that complicated. Like all the stories in this series, there is something very bittersweet about In an Absent Dream. The stories offer doorways to worlds where these characters can find love, acceptance, alternatives... but something is always lost at the same time. This one, especially, crawled inside my heart. It is sad in the best way a book can be sad-- without manipulation or something obvious like death. It is sad because change can be sad. Choices can be sad. In An Absent Dream stars Katherine Lundy, the therapist who leads the group sessions in Every Heart a Doorway. She is Eleanor’s second in command, and claims to be eighty-years-old, despite only looking around eight. And this is her story, about her time in her world, the goblin market. And, friends, this might be my favorite book in the entire series so far. Lundy is only six years old when she realizes that her entire life is going to be planned for her. She is going to be quiet, and studious, and keep to herself, and maybe one day she will be a librarian (because she loves books), and then become a wife and a mother. I mean, this is the dream, right? It’s for sure her parent’s dream for her. But even at six, Lundy knows this isn’t the life she wants, even if it is the life that is expected of her. And one day, Lundy finds a door, her door, and it completely changes her life. And in the goblin market Lundy learns so very much about herself and who she truly wants to become. And Lundy is also able to travel back and forth between the market and home throughout this glimpse into her life. There is a such a beautiful theme of the power of love between siblings, both found and blood, and that thread is carried through for each visit. Lundy, Moon, and Diana each have a piece of my heart that I won’t ever get back, and I’m a better person because of it. Friends, I loved this. It’s a magical masterpiece and a perfect addition to this series that Seanan has given book lovers everywhere. I know the release date isn’t until January 8th, 2019, but preorder this now. Trust me. Each and every book in this series is not only expertly crafted, but also the theme will be hard hitting and impactful. Every Heart a Doorway is about asexuality and realizing how important it is to surround yourself with people who unconditionally love and accept you, all of you, because you’re worthy of it. Down Among the Sticks and Bones is about gender norms and stereotypes that the world horribly puts onto us, and how it’s a horrible cycle that never stops. Beneath the Sugar Sky is about loving yourself and no matter what your body looks like, that it’s perfect; fat, skinny, with scars, with hair, with modifications so that you can be the person that you want to be. And In An Absent Dream is about how we live in a world that has completely lost the meaning of what is fair and what is just and what is right. Like, the price of peanut butter, something that I buy constantly, is $4.00 at my local supermarket. $4.00 for protein filled goodness that my mouth and the rest of my body loves to consume. But spending $4.00 on something when I have $100 dollars in my purse is a lot different than if I was spending $4.00 if I had $5 in my purse. And this is such an easy to see concept, but so many humans fail to see that tremendous difference. People want to condemn others for being lazy, or uneducated, or whatever else gross thing they want to say when they refuse to check their privileges (that they have mostly received from just simply being born), but the simple matter is that this isn’t fair. Jeff Bezos’ kids walking into Walmart and buying food isn’t the same as an underprivileged kid in Flint, whose family is on a fixed income (and still forced to buy their own bottled water), walking into Walmart to try to buy groceries for their family. But no matter how easy that is to see, I can’t teach people to have empathy. We all need to do better, and we need to change this obviously broken system. Just, be good humans, friends. Try to learn, try to do better, try to break these gross cycles that reinforce these gross entitled mindsets. And read Seanan McGuire’s books, which not only are such amazing escapism works of art, but they beautifully shed light on all these important topics that a lot of people wish to keep ignoring. And maybe, just maybe, we will one day live in a world where we don’t need a goblin market to remind us to be fair to other humans. But I hope that world is also filled with more books from this once in a lifetime series. Wasn't planning on reading it.... yet here we are! This was probably my favorite story/world to explore in this series. I've read a few of McGuire's books (6?) and in all of them I've felt like "something" was missing. They're very atmospheric, the writing is beautiful and the world building is interesting but the stories always feel a bit empty. For example, in this one you totally get a fairytale but better feel but every time any action would happen we fast forward to after the events have unfo Wasn't planning on reading it.... yet here we are! They're very atmospheric, the writing is beautiful and the world building is interesting but the stories always feel a bit empty. For example, in this one you totally get a fairytale but better feel but every time any action would happen we fast forward to after the events have unfolded. If you usually love character driven books this series might be for you. The Lundy who had stepped through the door for her second visit to the Goblin Market would barely have recognized the one who came stumbling through it for her second return to the world of her birth. This Lundy was thin, her arms and legs wiry with new muscle, rendered lean by physical labor and the rigors of questing. This Lundy had bruises on her ribs and a narrow scar down the middle of her back, tracing the outline of her spine, where the Bone Wraiths had tried to set their captive countryman free of the fetters of her flesh. although i always look forward to a new book in this series with the anticipation of a thousand christmas eves, if i’m honest, i wasn't over-the-moon excited to learn that this was going to be lundy's story. lundy hadn't given me any heart-stirrings in the previous books, where she was a peripheral character at best while my eyes were drawn to flashier characters like kade or sumi. but i should have known that seanan mcguire could make me love any damn character. i'm pretty sure her bookpages use paper made of a combination one part wood pulp, one part ground-up ecstasy, which leaches into the reader through our fingerpads, transporting us into states of wonder and rapture where even the horrible and sorrowful parts soften into o so tender heartache and everything just feels right. so that's one reason to not read e-versions of these. and i feel it all in my EMPTY HEARTCORE. and as it turned out, lundy's story was actually more gutting than some of the others because, unlike kids who experienced their just-right altworlds and were ousted once, lundy had the opportunity to experience a sort of dual citizenship until her 18th birthday, choosing her goblin market time and time again before the events that closed the door on her forever. plus, the extra heartsnap of a family member who had been there and chosen differently, which is also more than most of the other kids had, although it turns out that understanding it doesn't actually make things easier. at all. nor being sure of what you want. this series has all my love forever. thank you for understanding that trilogies are never enough. It would almost feel too cliché to use the title of a book to describe it, but in this case, it’s too fitting, too accurate, it too perfectly captures its essence, so as not to. In an Absent Dream takes you on a journey to a whole new world that is curious, and whimsical, and leaves you feeling like you woke up from from a deep slumber with a wondrous tale faintly imprinted in the back of your mind—it gives you the same feeling as that of waking up with faint remnants of a dream, which, the harder you try to hold on to, fade from your grasp all the more quickly, too far gone, too absent to remember clearly, but still there, subconsciously threaded through every fiber of your being. This book is more than than the sum of its (extraordinary) parts. And my quoting Aristotle is most definitely a nod towards how this book not only tells a story that is eerily reminiscent of a dark fairytale, with a dash of Alice’s adventures in Wonderland, but also a reflection of a deeper theme that is seamlessly woven into the story, without much fanfare, but still all-present. In an Absent Dream is about friendship, loyalty, family, about staying true to yourself, and about doing what is just; it’s about looking out for not only yourself, but others, too, and it’s about not only equality, but equity. Above all, I was completely entranced by the lyrical and atmospheric writing. Seanan McGuire creates a world that teems with suspense and mystery, and she weaves a tale that completely, and wholly fascinates, and captivates. I wasn’t spell-bound by merely her writing, however, but also by all the little details that make the characters so memorable, and real, and the world come to life in front of my eyes. You just know that the author gets her characters, and understands their motives, and you are made to experience everything the characters go through, as if they were your close friends. I can only encourage you to read this book, all the other books in the Wayward Children series, and probably everything else Seanan McGuire will write in the future. Thank you to Tor.com for sending me an ARC of this book in exchange for an honest and unbiased review. The quotes above are subject to change upon publication. 🌟 This is the 4th Novella in the Wayward Children series and it is still getting better. I think this is the one that spoke to me most and I will mention why later. 🌟 I am so picky when it comes to books and I try to choose books that I am sure I will like. That is one of the reasons that makes me like the writing style of most of the books I read and although there is a variability between the writing styles, there are always things that come and surprise you as this one did. I did not know that I missed the writing style so much until I read this! Seanan McGuire has such a beautiful & poetic prose! 🌟 The Characters were great and there is always a theme the book is discussing. This was the story of Lundy who we met in the first book. The book involved Gender roles and the parental roles in life. Then there were the sacrifices that we make in order to reach a certain thing in life we want. Lundy was well written and I can’t wait to see how her story will continue. 🌟 The Pacing in these books is just right! It is not too fast or slow, it is so appropriate for a novella of this kind. 🌟 The plot was maybe my favorite for a personal reason, I usually refrain from including those in my reviews but I have to explain this time. I feel like we all live in our own Goblin Markets and we struggle to choose things sometimes. As a medicine student who is graduating soon, I have a choice to stay as a GP or to travel abroad and get a specialty. I am leaning toward the later but the “Fair Value” that the book mentioned is what’s making me hesitant. Maybe I am overseeing things and I am just consumed by that thought that I saw it in this book or maybe we all have things that we try to wight the “Fair value” of. That’s why this plot was my favorite in the series so far! God, I just keep letting these books break my heart. Emailed publicist asking for an ARC. Gets brand new copy from the library today. In an Absent Dream is so beautifully heartbreaking. no In an Absent Dream is so beautifully heartbreaking. can this series never end?? When a very serious little girl finds a magical door in the woods, she decides to leave behind a life of loneliness to go off in search of adventure, never expecting to find a mystical Market on the other side—where anything can happen, as long as you pay your debts. 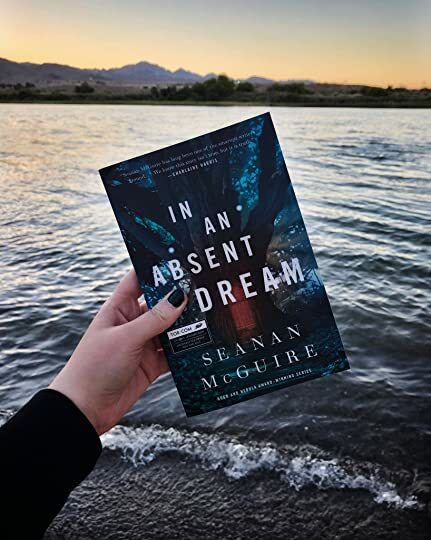 If you know me, you already know that Seanan McGuire is one of my all-time favorite authors in the world, and I adore this series, so I was beyond excited to read In An Absent Dream. It was one of those books that I received and then proceeded to spend a couple of months swooning over it on my shelf without reading it just because I wanted to savor the anticipation (which might sound silly, but isn’t uncommon for me), and wow, did it deliver! Of such commonplace contradictions are weapons made. Katherine Lundy walked in the world. That was quite enough to set everything else into motion. As always, the writing is positively stunning. Seanan excels at crafting these incredible, atmospheric worlds and building up characters I can fall in love with effortlessly. Despite having already known Lundy from previous titles in the series, she becomes an entirely different character—in a good way—thanks to how fleshed-out and complex she feels throughout this novella. While our environments were different, I related easily to so much of Lundy’s childhood—particularly her quiet loneliness that she didn’t even full recognize as such, and her all-consuming need to lose herself in the world of stories—so, I’ll be the first to admit that my adoration of her character comes from a personal level. Then again, it seems like every book in this series has held at least one character who could hit me in my bones like Lundy did, so maybe Seanan is just that magical. She had been able to find a doorway and disappear into an adventure, instead of living in a world that told her, day after day after grinding, demoralizing day, that adventures were only for boys; that girls had better things to worry about, like making sure those same boys had a safe harbor to come home to. 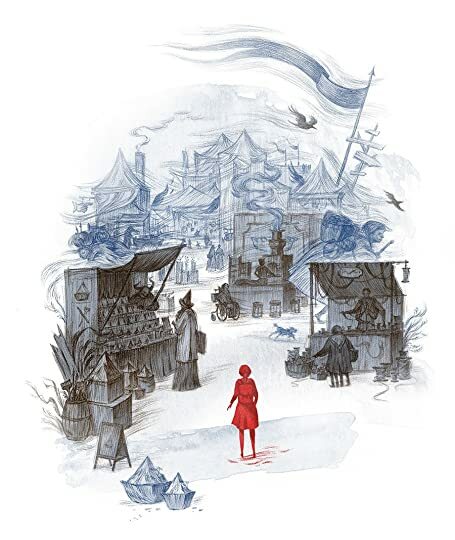 The world of the Market is, in my opinion, the mosh fleshed-out portal world we’ve met thus far in the Wayward Children series; it follows very clear and defined sets of logic, and is easy to fall into in a way that made me never want to leave. I know we typically don’t revisit Doors in this series, but I wouldn’t mind another entire novella based in Lundy’s world; despite it not being a clear favorite of mine in atmosphere and setting, it was easily the most three-dimensional and “real”-feeling one to me. As usual, In An Absent Dream is yet another Seanan McGuire title I simply cannot complain about. I have nothing negative to say, and the only thing I would change is that I wish I had the 5th book in the series in my hands already, because I am always ready to return to this beautiful universe of doors and worlds. If you’ve enjoyed the prior books in the series, I heartily recommend picking this one up; however, even if you haven’t read any of the Wayward Children books, you can read this at any time as it’s a prequel that takes place totally separately from the events of the first 3 novellas. Even if you aren’t a major fan of the series, if you enjoyed Lundy as a character, or if you are looking for a delightfully fresh take on the Goblin Market, this one’s for you. This book was a dream to listen to. These Wayward children are all pretty damn awesome. It's not hard to love a land built on your heart's wishes, a heavy dichotomy between fantasy and reality, and the rules that go along with it. Lundry, in this one, feels damn important to me. It's almost like I was her. :) Bookish, reliant on rules and in love with Fair Value. She never wanted to game anyone. She only wanted to get by and remain invisible within the rules... and she eventually got her wish. So pretty, poignant, and full of heart. These Wayward children are all pretty damn awesome. So pretty, poignant, and full of heart. This is the story of Moon and Lundry. A cautionary tale. A tragedy. Some hope. This is definitely my favourite volume so far of this enchanting series. We follow Katherine Lundy, a girl of (at first) 8 years of age, and experience how the little bookworm doesn’t have any friends anymore because her father is her school’s principal. She’s fine though since she has fictional worlds to escape into. Sounds familiar? Exactly! One day, as with all the wayward children, a door opens. In Katherine’s case, it’s the door to a world full of her beloved rules. The world is called the Go This is definitely my favourite volume so far of this enchanting series. One day, as with all the wayward children, a door opens. In Katherine’s case, it’s the door to a world full of her beloved rules. The world is called the Goblin Market. You only get if you give in return and fair value is most important of all. The market itself ensures that nobody gets taken advantage of. For a girl already liking rules and hating the world of her birth where she is told she's less because she’s a girl (that teacher - URGH! ), that sounds like paradise. Naturally, the world is not without its dangers but since Katherine befriends Moon right after stepping through the door, it’s ok.
Until the years pass and with them her chance to travel between the worlds; until she has to make a choice. This time, we didn’t start with Eleanor’s home but followed Lundy (the name Katherine chooses at the Goblin Market as real names have power, which every bookworm reading fantasy already knows) back and forth between the worlds throughout her childhood and teenage years. The author has an uncanny way of making these strange and magical worlds come to life and just make sense to us. And, what I really appreciate, she isn’t trying to tell the readers how it is OK to be stranded here and that we simply haven’t seen the hidden beauty of this "real" world - she makes it clear that she, too, would much rather barter some pencils for pies. What got to me the most was that in the end (view spoiler)[it was Katherine’s love for others that stranded her here. All of these people she cared about and didn’t want to hurt and NOT ONE OF THEM asked if they were hurting HER. She even tried to explain it to Diana but it was all mememe from them. Neither her sister nor her parents cared one lick what SHE wanted/needed. I can sort of forgive Diana as she was only 8 or 9 at first and her mother simply wasn’t told and therefore couldn’t understand (bad enough though that she never asked either) but that disgusting father?! I hope he had a miserable life in the end. If only Lundy had been more selfish (hide spoiler)]! Trish *lol* That is funny. And sad. D Dyer I’m reading this very soon. In an Absent Dream is heartbreaking in the most beautiful way. McGuire gives us a story that early readers of the Wayward Children series already know ends in tragedy, but she does so in a way that maintains both int You can find this review and more at Novel Notions. In an Absent Dream is heartbreaking in the most beautiful way. McGuire gives us a story that early readers of the Wayward Children series already know ends in tragedy, but she does so in a way that maintains both interest and, amazingly, hope. I honestly didn’t think Down Among the Sticks and Bones could be topped, but I stand corrected. What a way to start off 2019. The Goblin Market is everything I dreamed of as a child. Even before we reach the Market for the first time, I was in love. The description of the magical tree containing Lundy’s door captured my imagination on its first appearance. I felt that it was a perfect visual representation of the spirit of the Market. It is a “good tree,” one made for enticing children to play in its shade and climb its branches. Its leaves are every possible shade of green, with no two exactly the same shape. It is blatantly magical before the door it holds is even revealed. While I was a happy child with an amazing home life, I related to Lundy deeply on multiple levels. I was a very social kid, and yet I had an insanely hard time developing relationships with children who weren’t relatives. Adults loved me, but there was something about me that made me easy for kids to overlook until I hit the age of twelve. I think one of the major reasons for this stems from the other way in which I relate to Lundy: an insane love for and attachment to the written word. Until she stumbled into the Goblin Market, Lundy walks through life with her head perpetually stuck in a book. However, Lundy’s entire worldview changes when she steps into the Market for the first time and finds her true home. The question is, can she stay? I loved the descriptions of the Market. It was lush and enticing but left plenty to the imaginations of the readers. The rule of fair trade, as well as the other rules that govern the Market, are interesting in their duality of simplicity and complexity. But my favorite aspect of the Market is the idea that it is actually its own entity, whose interpretation of the rules is law. There is both a freedom and a rigidity to the Market that would have absolutely captured me as a child, as it has evidently done with so many other children. Believe it or not, kids thrive on a certain amount of rules as long as they aren’t stifling., and the Market hits the perfect balance. Everything has a price, and debt makes itself visible so that you can’t claim that what you owe slipped your mind. But is the Goblin Market really an incredible haven, or does it set out to entice and ensnare? If it’s a haven, why does it only call children to itself, and close its doors to them if they don’t decide to become citizens before the age of eighteen? If the Market truly wanted them to be sure, wouldn’t it call them as adults instead? There are so many questions raised by and about the Market, and yet it’s hands down my favorite of McGuire’s portal worlds so far. There was nothing I didn’t love about this novella. The characters, the motivations, the settings, and the concept were all amazing. (Side note: I want to be the Archivist when I grow up. She’s warm and cool, motherly and friendly while still maintaining the aloofness and lack of bias needed to fulfill her role in the Market. I thought she was perfection.) While all of these elements were beautifully rendered, what grabbed me once again was McGuire’s prose. She has such a stunning way with words. I kept reading the same sentences over and over again, sometimes even reading them aloud because they felt so velvety on the tongue. What blows my mind about In an Absent Dream is the fact that, going in, I already knew how it was going to end. And yet the ending still absolutely wrecked me. I’m baffled by how much Lundy’s story impacted me emotionally. Do I recommend this book? Without reservation, to anyone and everyone. Whether you read fantasy or literary fiction, whether you love YA or hate it, whether you’ve read the preceding books in the series or not, In an Absent Dream is absolutely worth reading. While having read Every Heart a Doorway first is suggested, as you will first meet this book’s protagonist within its pages, it’s not required. And if you happen to be a fan of the Labyrinth, Bowie’s cult classic film, you will undoubtedly have a soft spot for the Goblin Market as presented in these pages. This is a stunning story exquisitely told, and it deserves to be read. My love for this series just keeps growing. This installment is more similar to Down Among the Sticks and Bones than the other two, in that it fills in the backstory for a side character from Eleanor's school. You are immersed in Lundy's childhood and the world of her door. I admit I was disappointed when I heard this book was following Lundy because I she never struck a cord with me, but this book made me love her as much as all the other characters. Audio review: Narrated by Cynthia Hopkins, who My love for this series just keeps growing. Anyone else hoping for like 15 million more of these books (as well as a book about Cora's mermaid world)??? I sure as hell am!!! "To be a child is to be a visitor from another world." In In an Absent Dream we follow Lundy, the child psychologist and therapy session guide at the school for wayward children. She looks eternally young despite her wisdom and in this book, we learn her backstory, her doorway world, and how she came to work for Eleanor West. This is a particularly unique story for the series because it follows Lundy and only Lundy unlike other stories which have had a host of characters (or in Down Among the Sti "To be a child is to be a visitor from another world." In In an Absent Dream we follow Lundy, the child psychologist and therapy session guide at the school for wayward children. She looks eternally young despite her wisdom and in this book, we learn her backstory, her doorway world, and how she came to work for Eleanor West. This is a particularly unique story for the series because it follows Lundy and only Lundy unlike other stories which have had a host of characters (or in Down Among the Sticks and Bones two). I loved the singular nature of it and how well we got to know this amazing character. "Your name is your heart, and you don't give your heart away." This is a story of a lonely child who learned much too young that you can only count on yourself, and that books and your own imagination are fantastic but you still miss actual friendships with children your age. It's a cruel world when you aren't included in your peer group and Lundy, the daughter of the local elementary school Principle knows that all too well. "...it's a wonder we don't all walk around with ledgers in our hands, measuring our breaths to be sure we've contributed enough to the world we live in to justify them." In the Goblin Market, there is a fantastic discussion to be had about economic status and bartering/paying with fair trade...making sure that you give as much as you take from the world and people around you. It was beautiful, pure, and scary at times because a value is subjective and it comes down to how much you value the people and the world you live with/in. I loved this aspect of the story so so much. "Still, there is a magic in the word "sister", a magic which speaks of shared roots and hence shared branches, of a certain ease that is always to be pursued, if not always to be found." There is also a focus on family, both found and blood and Lundy's relationship with both Moon and Diana are precious and should be protected at all cost. Reading this right before my baby sister's wedding got me all teary eyed. I love my sisters, both blood and found, and I value their love, trust, and friendship so much. "There are many good things in the world, and each of them happens for the first time only once, and never again." All of these stories are richly woven, dark and dangerous but also hopeful and beautiful, much like the world we actually live in. Nothing is ever all good or all bad and this story is no different. There are prices to be paid for mistakes and nobody is immune to them, not even children. As in any world, you learn quick or you face the consequences but there's a beauty in the symmetry of this book and the market. As always, another fantastic read and a great addition to the series. I totally forgot I read this in February so I'm adding this to GR now! Ugh, I love this series so much. It's just so special and always makes me feel so nice. This novella acts, just as books two and three do, as a prequel to the first. It involves Lundy and her trip into a wayward world, very unlike our own. One day, Lundy finds her mind lost inside of a book and her feet leading her into the land of the Goblin Market. I was unsure whether I was going to continue with this series, after being underwhelmed by the third instalment but I am so glad I did as this was the most whimsical and magical series inclusion yet and gave me everything I was looking This novella acts, just as books two and three do, as a prequel to the first. It involves Lundy and her trip into a wayward world, very unlike our own. One day, Lundy finds her mind lost inside of a book and her feet leading her into the land of the Goblin Market. I was unsure whether I was going to continue with this series, after being underwhelmed by the third instalment but I am so glad I did as this was the most whimsical and magical series inclusion yet and gave me everything I was looking for in the previous three. In a story about a girl going to a place named The Goblin Market you probably shouldn’t expect something akin to a happy ending. And if you also read some of the other books in this series you know at least that Lundy currently looks 8 but is really somewhere in her 80s. This is her story, about a door she walked through more than once, bargains made and loopholes that didn’t turn out as expected. Catherine Lundy has understood since six that she does not fit in the life she has. She has felt out of place and not part of the world around her since she can remember. She has kept to herself and been at home in her own company, with very little use for the world around her. So when walking home one day a tree that shimmered with a door in it was right in her path she opened the door and made her way into a world she did fit into. Sparkle and shine are pleasures reserved for predators who can afford the risk of courting attention. The exceptions, which exist for all things must have exceptions, are almost entirely poisonous and will sicken whatever they lure. So even the exception feeds into the rule, which states that a bright shimmering thing is almost certainly looking to be seen and that which hopes to be seen is pursuing its own agenda. This isn’t really a kind world but a pocket in space and time that has specific rules. I’m going to say that Seanan McGuire has a way with worlds. They are all a little dark and grim-like in the feel of them. The Wayward Children series especially has had a lot of wonderful yet deadly types of worlds. The Goblin Market was not an exception to this rule. It is a world where if you do not do the right things and contribute enough being fair in your dealings with others it will show. The world uses a trade and barter system and if you and not contributing enough you might grow talons or feathers, your body will start to shift to the anatomy of the creature you will turn into if you let it go too far. But it is a fair world where you can also do the right thing and the feathers on your chest or in your hair will go away. Everyone is a contributor to the community and those that aren’t wear it on their skin. I found the world fascinating and Lundy’s friendship with Moon cute. The Archivist, a keeper of knowledge and a helper of sorts for the Goblin Market was also a great and semi scary character in the story. I was very engaged in the story and didn’t understand why Lundy would ever go back to her family since she seemed to fit into that world well. My only complaint for this tale other than it didn’t have a happy ending, even if it had a deserved ending perhaps is that I wanted to see some of the quests that Lundy and Moon went on. Most anything action related was off page and while the book was very engaging it would have been interesting to see that part of the story as well. I totally enjoy these stories and I will continue to read them but I will note that this is a novella that costs $9.99 or you can get the audio version for $14.20 through audible and there is not wyspersync deal if you want to get both the audio and ebook. I only got the audio because I had extra credits from Christmas for Audible and so I needed to use 5 this month. For something that is 187 pages long I think it is a lot of money. I think that is limiting the readership on this series for sure as I usually have a buddy read for all of Seanan McGuire’s books as they come out but the 4 other people I usually read it with opted out. I love the writing, I love the worlds. This series never fails to inspire and wow me. This wasn't my favorite only because the rules of the world confused me, even after having been stated several times. But I love Lundy and seeing her playful side and seeing how dedicated she was to everyone she knew. WHEN WILL THESE BOOKS END HAPPILY FOR MY BELOVED CHARACTERS?! 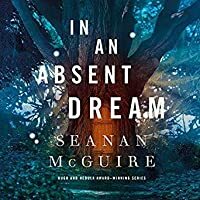 In an Absent Dream is the latest novella in Seanan McGuire's Wayward Children series. I've read every single novella and this, the fourth, is just like the previous ones fabulous. If you love reading books about children traveling to other realms then you really need to read these novellas. What I love about them is that they are so dark, so horribly cruel and also sometimes so funny. 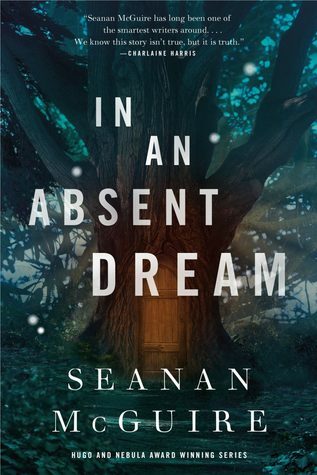 The story shows how children who travel to other worlds and come back, are so changed by their experience that t In an Absent Dream is the latest novella in Seanan McGuire's Wayward Children series. I've read every single novella and this, the fourth, is just like the previous ones fabulous. If you love reading books about children traveling to other realms then you really need to read these novellas. What I love about them is that they are so dark, so horribly cruel and also sometimes so funny. The story shows how children who travel to other worlds and come back, are so changed by their experience that they just want to go back. In an Absent Dream, we meet a bookish girl that travels to a world of logic and reason and she feels at home. However, she is torn between two worlds, between the world she left behind and the one she found. Will she, in the end, be able to choose which one to belong to? This story is fabulous, with a heartbreaking ending. I recommend it warmly. Oh look, I never came back to edit this review... I’m shocked. Lundy’s story is probably my... third? Favorite. But it’s definitely splitting hairs with my love for Down Among the Sticks and Bones and Every Heart a Doorway. That said I feel like this one was the strongest and most cohesive. Part of this can be credited to the Goblin Market itself and its structure. This allowed the novel to follow a really linear timeline and without many deviations. Now the Goblin Market is un Oh look, I never came back to edit this review... I’m shocked. Now the Goblin Market is unique and is ruled by rules. The two most important is 1) that you must give fair value, 2) be sure. Suffice it to say this book was incredibly enchanting, super quotable, and had some dark lessons in it. So my thoughts right. Don’t continue if you want to be spoiled now. I flat out don’t think Lundy was ever sure of what she wanted. She wanted friends, she wanted adventure, and she wanted a family. But she didn’t understand that in this world, in this Goblin Market, she could have all of those things, but she’d never see her real family again. Once she spent time with her sister in the real world Lundy couldn’t decide what she wanted. She, quite frankly, deluded herself that she knew what to do and. she. didn’t. Why? Because she’s a child! Multiple times she was asked by the archivist if she was sure and she said she was. But she kept going back to earth... while at the same time trying to keep her ties to the Goblin Market via feathers in her hair one time and constantly collecting items for trade. She is singular in her desire to return to the Goblin Market. But the Goblin Market wants you to choose it and only it AND LUNDY ISN’T SURE OF WHAT SHE WANTS. HOLY MONKEYS! This honestly was the best one yet. I can’t do a proper review yet because that would be against the rules (Lundy would be so proud of me!) and I don’t wish to anger the great people of Edelweiss. I will however say this one was honestly my favorite one yet. “Be Sure” is the motto for these books and I am sure Lundy’s story is my favorite. She is THE MOST LOYAL woman-child ever. I can’t wait for y’all to meet Moon.